Have you ever heard of lifesaving ‘EpiPen’ or ‘DIY EpiPen’? EpiPens(Epinephrine) are auto-injectors meant as a last-ditch measure to escape from the allergic reaction which may lead to death. This allergy is known as ‘Anaphylaxis’ which is caused by Insect bites/sting, Food, and Medications. The symptoms of Anaphylaxis are an itchy rashes, throat or tongue swelling, vomiting, low blood pressure, light-headedness, shortness of breath. Spontaneous treatment to this Anaphylaxis may result in Unconsciousness and even lead us to death. This Epinephrine drug is 100 years old. But the device EpiPen makes it easy to inject for everyone. Mylan is the only one pharmaceutical company all around the world to manufacture this EpiPen device. Nobody has built an alternative to EpiPen due to several reasons, they may be patent protection, fear of building device that doesn’t work efficiently or the reason being a regulatory process of getting that product to the market etc… With the increase in the demand for this drug has led to the supply of all over the world by only one company. Recently, Mylan has increased EpiPen price skyrocketed from $100 in 2007 for a pair to $608 presently. That is 4.61 percent increase after acquiring the rights in 2007. The over pricing has resulted some people to prevent access to this reliable EpiPen to treat Anaphylaxis. 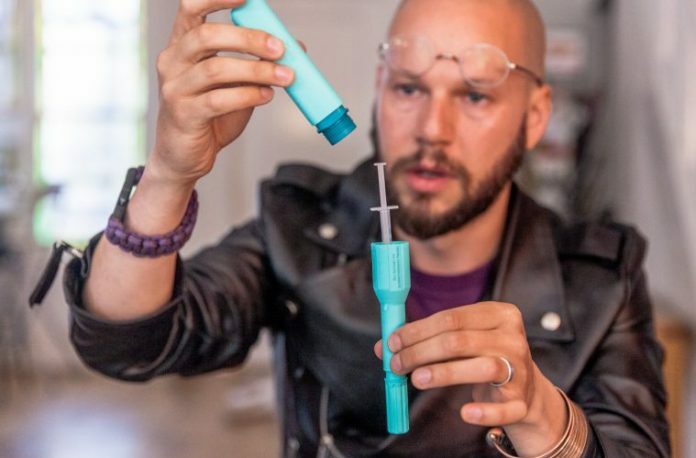 The over rising in price has led to manufacturing of many alternative solutions from EpiPens by biohackers. A team of DIY enthusiasts had researched on this and discovered a very cheap way to manufacture the EpiPen with just $30 only. Calling themselves as Four Thieves Vinegar had published plans for anyone to make a device for self-injecting epinephrine. 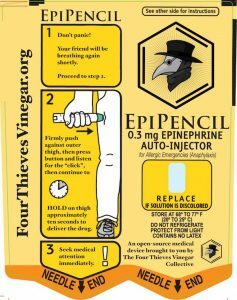 Four Thieves Vinegar has revealed that the components of the product(EpiPen) only costs about $30. This EpiPencil also pairs an existing auto-injector for people suffering from hypodermic needles. The question raises here is, how far using this EpiPencils is reliable which are made at home.